Diversity in the workplace is vital to having a successful company and a positive employment brand. Having candidates from various genders, races, age groups and religious affiliations will ensure that you are looking at the best pool of candidates. As recruiters and HR professionals, we should take a moment to evaluate the benefits of having a diverse pool of employees, and how to assimilate new hires from diverse backgrounds and experiences into the company. Diverse workplaces foster innovation, improves employee performance, offers a selection of various talents, skills, perspectives and experiences, and increases your talent pool. Take a look at your hiring process and see where your company may fall short. Check out these tips to see how you can change each aspect of your candidate’s experience so you too can attract top talent. 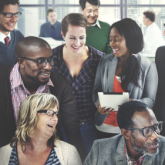 If your career site and new job postings promote that your organization embraces diversity, ensure that is an accurate depiction of your workforce. Look at your C-suite. Are they all the same race? Are they all male? If you answered yes to both of those questions, that might be a good place to start. Your leadership team heavily influences the culture of your company, and shapes the brand image both of current employees and prospective employees. For example, according to a recent iCIMS survey, it is evident that U.S. companies are making progress, but still struggle with gender issues, including the pay gap, parental leave, hiring women in science, technology, engineering and math (STEM) industries and promoting women to C-level positions. Having female leadership may boost the confidence of a company’s overall workforce when it comes to compensation. According to the survey, office professionals (both men and women) at companies where half or more of the executives are women, are significantly more likely to feel very confident in their ability to successfully negotiate a raise with their employer, compared to those who work for companies where less than half of the executives are women. Men and women equally aspire to obtain a position in the C-suite, and that number only rises with millennials, with 87 percent of women and 74 percent of men striving for those C-level spots. The problem is not their ambition, but rather the fact that on average, 32 percent of high-level or C-level leaders are women. This statistic is discouraging for many women and leads to a “If no one before me could get there, how can I?” mentality. When interviewing a potential new hire, tell them about the company’s commitment to diversity and what your next steps are to making that happen. According to the same report, the top three things that women look for in a job are health benefits, schedule flexibility, and work/life balance, compared to men, who look for health benefits, work/life balance, and career advancement. Knowing this, make sure your candidate knows what your company offers in regards to PTO days, maternity/paternity leave, working from home, etc. Women tend not to ask about these benefits your company may offer because they fear it will make them look uncommitted to this new job. Providing this clarity for them right off the bat, saves them from feeling uncomfortable bringing it up later and instead they will feel supported and valued within your company. After your candidate has officially become your new hire, focus on assimilating them into the company. One great way to go this is by encouraging employers to create internal communities and groups. For example, at iCIMS, we have a Women in Tech group founded by our Director of Test Engineering. The group discusses everyday challenges of being a woman in the technology industry, how to overcome them, tips for success, etc. Embracing the communities your employees create allows them to feel welcome, understood, heard, and part of a meaningful group. These tactics to implement before, during, and after hiring a candidate do not just apply to women. Everyone can benefit from diversity in the workplace.